It’s only the first official week of November but everywhere you look, it seems that the Christmas season has arrived. Stores are displaying their Christmas merchandise, coffee shops are touting their latest seasonal creations and malls are advertising their Black Friday sales. Too soon? We don’t think so! In fact, we’ve joined up with our friends at RecipeLion to bring you a brand new eBook filled with Christmas cookie recipes, quick and easy gift ideas and homemade Christmas crafts you can give to a loved one. 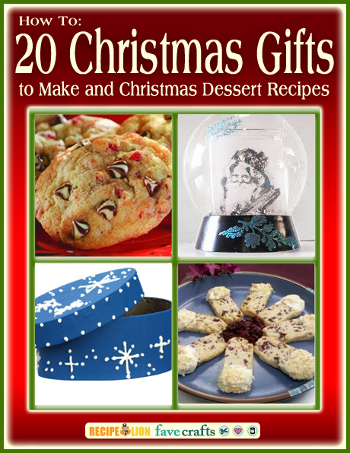 Best of all, How To: 20 Christmas Gifts to Make and Christmas Dessert Recipes is free to download. Picture your favorite Christmas memory. It could be baking with grandma or gathering around the tree on Christmas morning. What do these two moments have in common? They represent the absolute best aspects of the holiday season – togetherness! When you give a personalized gift, you show how much you care about the recipient. Your little touches and imperfections make the gift unique and memorable. Plus, it’s an indication that you took time to really plan and think about the other person’s interests. Another great way to bring the family together during the holiday season is through baking. When you include loved ones in this activity, you’re creating bonds that last long after the cookies have been taken out of the oven. 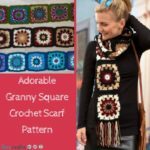 Cable Socks for Men – Start now and create a pair of warm and cozy socks for the man in your life. 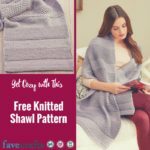 This knitting pattern is an old-school favorite that’s perfect for the chilly months ahead. Men are hard to buy and craft for, but these socks are versatile and wearable all winter long. Christmas Snow Globe – Need a quick and easy gift for a young person? Buy a snow globe at a craft or discount store and add rub-ons, glitter and more to change the overall look. You can also insert your own homemade image inside the snow globe – it’s a great way to quickly personalize a generic item. Christmas Tree Button Tote – Dip into your stash of buttons for this creative wearable craft. 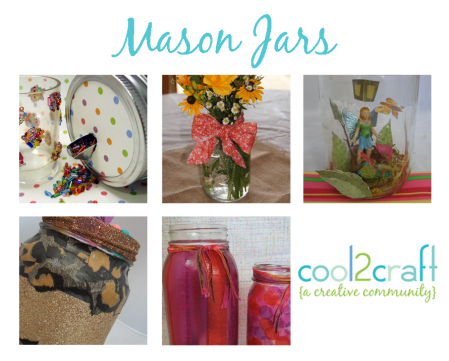 All you need is a free afternoon and a little creative energy for this quick and easy Christmas gift idea. Make matching totes for all of your friends and carry them all season long! This eBook is also filled with delicious Christmas cookie recipes from RecipeLion! Learn how to easily add chocolate to classic gingerbread cookies or make your own peppermint-shaped treats. Download a copy of How To: 20 Christmas Gifts to Make and Christmas Dessert Recipes today – it’s free! Now that smartphones and GPS devices are so prevalent, it seems that old-school paper maps are becoming obsolete. This doesn’t mean you have to throw them away, though. 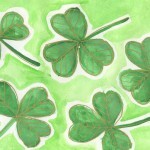 Save your maps and use them to create pretty home decor crafts, note cards and so much more. 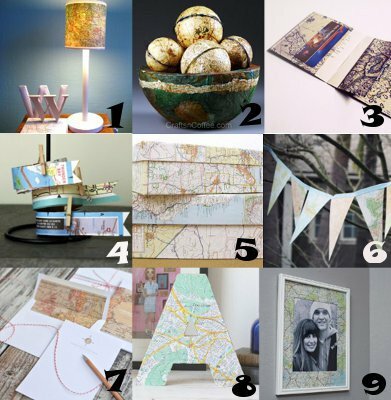 Maps are a great alternative to traditional scrapbook paper. They are generally thick and hold up well when covered in glue or other adhesives. They are also extremely versatile and can be use for a variety of craft projects. Christmas is just around the corner, so now is the perfect time to start crafting some pretty ornaments to hang on your tree. Cover a Styrofoam ball with an old map and add embellishments such as glitter or glass charms. Apply decoupage to the outside of the ornament to ensure a smooth surface, free from lumps and bumps. The light blues and greens from the paper make the Recycled Map Christmas Ornament a pretty seasonal piece. This is a non-traditional take on a very common craft! Maps can also serve as a great contrast to solid colored papers. Cut silhouettes out of black paper and mount the designs on a bright map. The range of colors will make the black paper pop off the canvas. Custom Couple Silhouettes are a great gift for newlyweds and can add to you decor for an anniversary or on Valentine’s Day. It’s important to remember that maps tell a story – they take you to another place and time, no matter where you are. Just one look at a map can take you on a creative journey! What are some of your favorite uses for old maps? 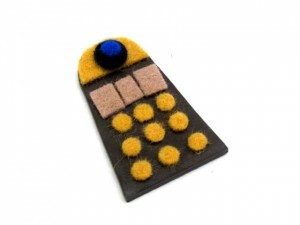 You’ve arrived the Geek Crafts column, your weekly dose of geeky goodness with Haley Pierson-Cox from The Zen of Making! Having one of those days? 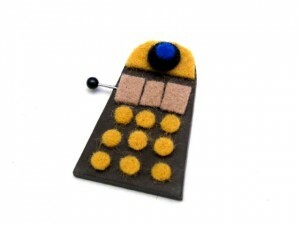 Add a little “EXTERMINATE!” to your step with a mini Dalek brooch, inspired by the cantankerous villain from Doctor Who! 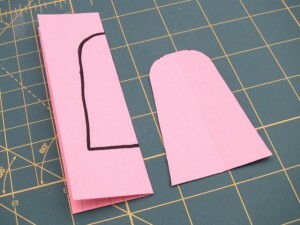 Using cardstock, make a Dalek template by cutting out a 3” tall triangle with a rounded top. 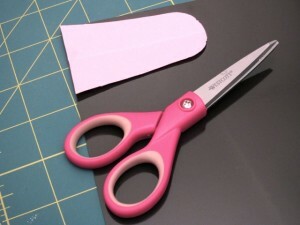 To keep my template symmetrical, I folded my paper in half and drew half of the shape at the fold before cutting it out. 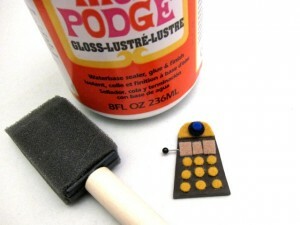 Tape the template to a piece of brown shrink plastic, then cut around the template to make a shrink plastic Dalek shape. 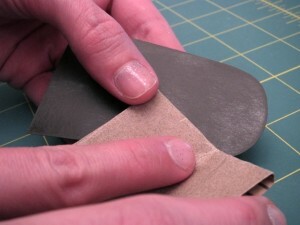 Smooth around the edges with sandpaper to remove any rough spots, then lightly sand the front and the back. Following the instructions on the package, bake the shrink plastic piece, pressing it flat and allowing it to cool. 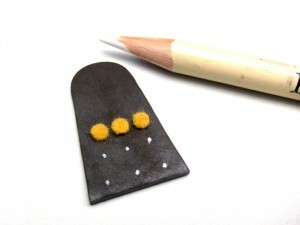 Using a chalk pencil, mark the placement of the dots on the Dalek background, then secure the gold felt dots in place using superglue. 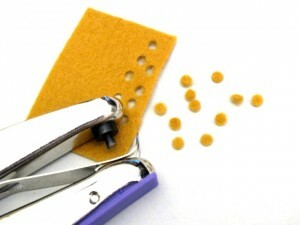 Attach the remaining felt pieces with superglue. 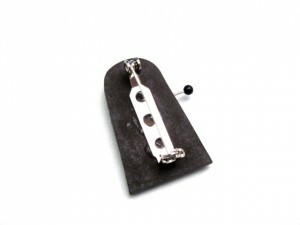 Clip the end off of the straight pin with wire cutters. 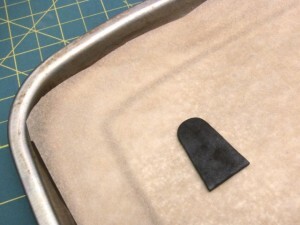 Slip the end of the pin under the edge of a tan rectangle and glue it in place. Seal the felt pieces in place with 2 coats of Mod Podge. 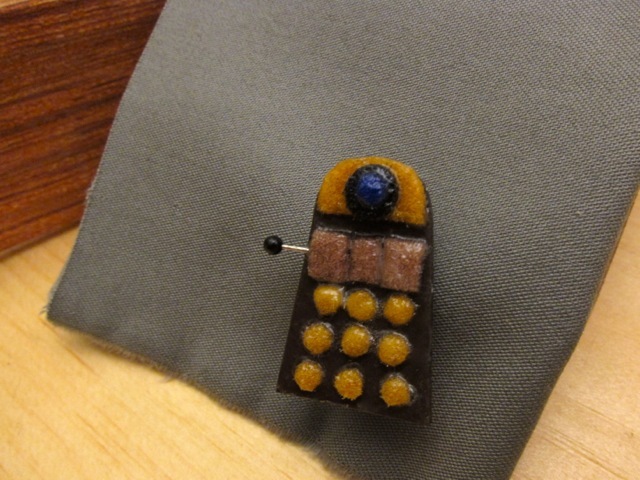 Glue the pin back to the back of Dalek, and allow to dry completely before wearing. Make sure you come back next Wednesday for more geek craft fun! Today’s Guest Post was written by Nichole Nelson. I may or may not have an obsession with jewelry. Okay, I’ll just admit it. I love jewelry. I am always collecting (and making) new earrings, necklaces and bracelets. So, I needed an easy (and big) way to store all my jewelry. Drum roll, please. Here’s what I made! 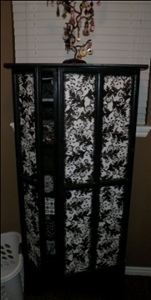 So, I found this cabinet at the local thrift store…only it was SO UGLY. So, I painted it black and spruced it up. (It desperately needed some excitement.) So, of course I pulled out the Mod Podge and my favorite black and white designed paper and went to work. But that wasn’t good enough for me. I also Mod Podged the inside! (The husband thinks I’m insane.) 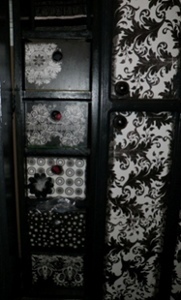 I thought it would be fun if each of the drawers had their own design. Eventually I’m going to make some labels for them, I just haven’t got around to it yet. I wish I had before and after shots of this project, but just take my word for it … it looks much better now. So, there you have it. 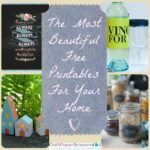 Seven fun and easy things you can do with Mod Podge. Oh, and in case you were wondering what my next craft project is…well, take a look at this UGLY table I found at the thrift store yesterday for $5. Five dollars! I couldn’t resist it. 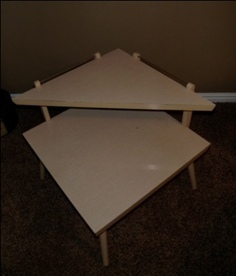 My husband asked me why I bought such an ugly table. Obviously he doesn’t have the vision, but I can see great possibilities with this table. This weekend I’m pulling out my paint and Mod Podge and going to work. Don’t you think it’ll be a great corner table? Just imagine it black…with some cute embellishments. 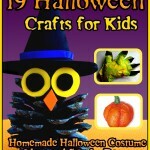 I can hardly wait to get crafting! Wish me luck! 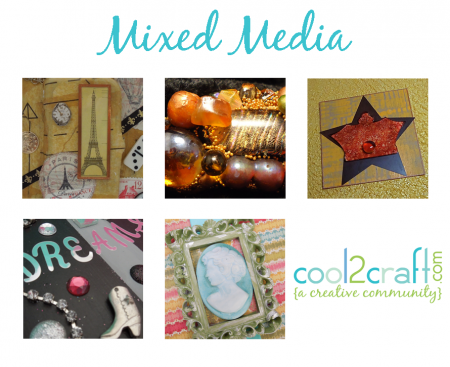 Nichole Nelson admits she’s a Mod Podge addict and craftaholic. 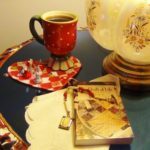 She’s a self-proclaimed word nerd and writer for TopTenREVIEWS by day and an avid crafter by night. In her spare time, she enjoys crafting (obviously), reading and trying to help her sweet husband understand her love for all things crafty. I don’t have much drawer space in my new place and the closet doesn’t have any cubbies to hold things like hats, scarves and belts. And there isn’t a dresser in the world (at least that will fit in the bedroom) that is big enough to hold all my clothes odds and ends. Is it just me? Maybe it’s my OCD, but I need hats together, and belts and workout clothes (which I should really wear more often) – I need lots of them and I need them organized. These closet organizers were just the thing I needed. Aren’t those bright colors fabulous? Every time I walk into my closet I smile. It looks so clean and orderly … and that makes my heart happy. All I did was spray paint the boxes black (that way they look nice from the sides and back) and then Mod Podge scrapbook paper to the top. Then have fun labeling and embellishing your boxes. Let them dry for a couple days before you throw your clothes in. And, if you want them to look nice on the inside, spray paint them and then hot glue a piece of felt to the bottom. Then, make sure you show them off to anyone who will come look at your closet. This would also be a super fun way to keep your little one’s toys organized! 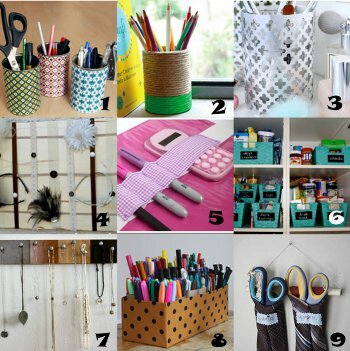 Up next: a sweet way to keep your jewelry organized. The husband says I have too many necklaces. How can you have too many? Seriously. Men. This guest post was written by Josh Richards. Want to stand out in a motorcycle rally? Part of the fun is getting noticed! Bikers are known for their dare-to-be-different style, and what better way to do it than pimping your helmet? Both pre-made and do-it-yourself options are available, but half the fun is making your helmet truly your own by reflecting your own style for the world to see! Have you ever considered adding a cycling Mohawk to your motorcycle helmet? While it might be a radical statement to do to your own hair, crafting a motorcycle helmet Mohawk is far easier to wear. Essentially you have two options—the fiber optic Mohawk is more visible at night, and the imitation hair Mohawk is made of synthetic fiber. 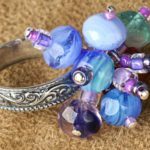 You can find imitation hair in a variety of craft stores and with some super adhesive glue, this is a really simple style improvement that can make all the difference. However, fiber optic Mohawks have their own benefits and are actually a safety feature, as well as a fashion statement. Once installed, the Mohawk requires a 12-volt battery, and has an optional flash feature. Many companies offer lights in blue, white, or red. Whoever thought of the “hair helmet” was a genius. These decorations give a whole new meeting to the phrase “helmet hair.” In fact, after seeing it, it will be something you want to have and of course, anything that gets you noticed will keep you safer on the road. The ultimate conversation piece, you’ll have people stopping you all day long to ask how you got your hair to stick through the helmet. Don’t wear this one if you’re shy! Simply head to a wig store and let your imagination run wild. This idea is literally exactly as it sounds, apply multiple types of hair or stick with one solid color and your will be protected while causing many to take a second look. 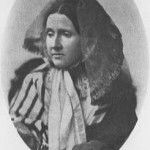 The two main types are ponytails and pigtails. Lady riders will have to get a set of pigtails when they see you wearing your uber-cool ponytail. Helmet hair puts everyone in a good mood—the rider, the surrounding drivers, even pedestrians. Apply with extra-strong suction cups. Helmet hair is typically treated with UV protection, if you buy it directly from a seller for that purpose, so it won’t fade or decay. 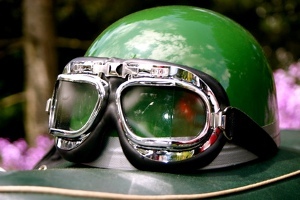 You can also find similar protective sprays to add on your own homemade helmet hair. It must be applied on a clean, dry two-inch surface, so scrape off those decals. If you want to pimp your own helmet, decoupage is the ultimate crafters dream. It involves collaging the surface of your helmet with photos and images of your choice, and then covering it with a protective coating. 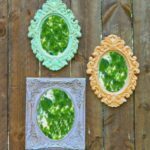 This coating can be purchased at a craft store or can actually be made by taking Elmer’s glue and combining it with water until it becomes quite watery and then it is spread across the collage pieces to create a protective coating and adhesive. Decoupage is a great way to make a personal statement and display it everywhere you go. Save the whales, bands, films; the sky’s the limit. Start by gathering enough decals, bumper stickers and images to cover your helmet about one and a half times. (Remember, you’ll be overlapping images.) Get the strongest glue that you can find—gorilla glue is good. As you apply the paper, smooth it down to eliminate creases as much as possible. Your overall design will emerge as you go, but you might want to put trimmed bumper stickers along the bottom edge. 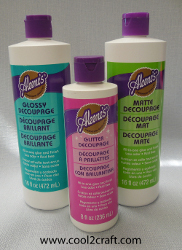 To protect the surface of your masterpiece, apply one coat of decoupage glue, and then spray with clear coat. Obviously, this will be more of a novelty display helmet than a racing one. Why not get out the poster paints and slap a big ol’ face on your helmet? It can express your inner demon or angel. It can be a caricature, or an animal face. Josh Richards is a contributing writer for Jafrum.com, a motorcycle enthusiast’s virtual heaven online.